Registration for membership is easy and just takes a few minutes. Click the REGISTER NOW button to the right. If this is your first time in the new registration system, choose"Create a New Bonzi Account"
If you have already created a Bonzi account, you can sign in and register for Umpire membership using the same email address you used previously to create your member account. You do not have to create a second account. Complete a simple registration form. You will be asked for your authorization and information to complete a background check. The fee for membership is $35. VISA/MASTERCARD are accepted for any fees charged. The annual registration fee covers background checks, PGF membership and insurance. PGF Umpire Insurance is available September 1 to September 1 each year. PGF requires ALL umpires to register EVERY season. All PGF Umpires are required to wear official PGF Umpire Apparel. How Do I Get My Insurance Certificate? After you are done with online registration, follow the links to go to your Member Account or Log In again using the same email address. After you log into your Member Account, click the MY REGISTRATIONS button. Click the PRINT button under the Insurance column. You may return to print your insurance certificate at any time. 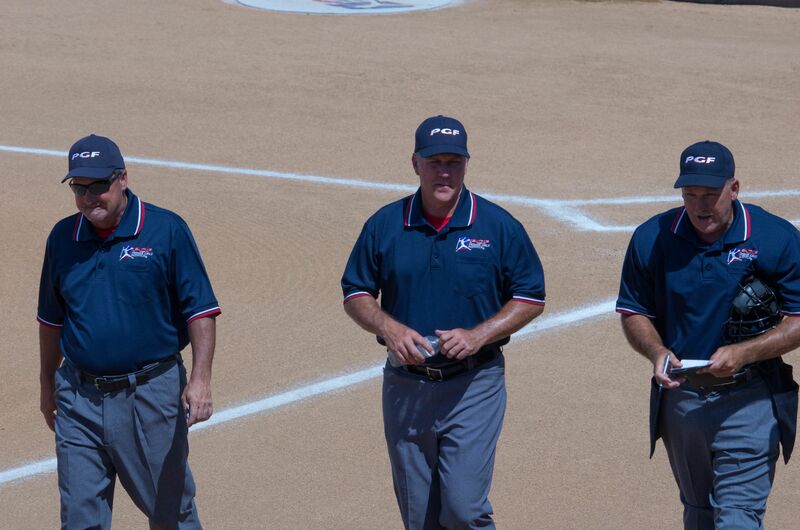 CLICK FOR PGF UMPIRE GEAR!